Wyclef Jean was born Nel Ust Wyclef Jean on October 17, 1969, in the small town of Croix-des-Bouquets, just outside of Port-au-Prince, Haiti. Jean was one of four children—three sons and a daughter—born to pastor Gesner Jean and his wife. 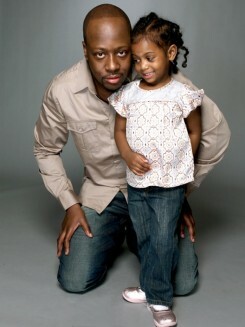 When Wyclef was 9 years old, his family moved to the Coney Island area of Brooklyn, New York. "When I got to America," Jean later told Ebonymagazine, "I was expecting to see money falling from the sky." But the Marlboro housing projects, where Jean and his family lived, didn't quite meet with Jean's initial expectations. The opportunities for Jean and his family, however, felt limitless compared to those available in their former home. Wyclef, who spoke only Haitian French when he entered the states, quickly learned English from listening to American rap music. Music soon became one of Wyclef's chief interests; his mother sensed his talent early, and gave him a guitar as a gift in the hopes of keeping him away from the local gang activity. The first song he learned to play was Steve Martin's humorous spoof, "King Tut." In his early teens, Jean and his family moved to Newark, New Jersey, so that Gesner Jean could assume a post at the city's Good Shepherd Church of the Nazarene. At Newark's Vailsburg High School, Wyclef stayed focused on his passion for music. He majored in jazz, studied the ins and outs of the music business, and learned to play more than 15 instruments. Wyclef, along with his cousin Prakazrel Michel and friend Lauryn Hill, also started experimenting with hip-hop music. In order to afford studio time to record their original compositions, Jean saved up money from his job at an area McDonald's. Jean's talent quickly came to the attention of music executives and, while he was still a minor, he was offered a recording contract. The deal fell through, however, because Jean's father refused to condone his musical tastes. "When I'd come back from the studio, I'd get a whipping from my dad, 'cause I was playing devil's music," Jean later told Rolling Stone magazine. I nstead, Jean and Michel played for Vailsburg High School's swing choir and formed a rap group called Exact Change, which rapped their positive message in six languages. Changing their name to Tranzlator Crew, they were signed to Columbia Records in 1993. After a legal dispute with another band named Translator, the group renamed themselves the Fugees, a shortened version of the word "refugees." Their debut album, Blunted on Reality (1993), received warm reviews and sold moderately well. But it was their second album, The Score (1996), which catapulted the Fugees to international success. The Score sold over four million copies in the United States, and more than 15 million worldwide. In particular, the single "Killing Me Softly," a remake of Roberta Flack's 1970s hit, stayed at the top of the R&B singles chart for seven months. The Fugees continued recording together, but they also began work on solo projects. Jean released and produced his album, The Carnival, in 1997, which explored the musical gamut, including a mix of Creole, salsa, reggae, Afro-Cuban, R&B, funk, rap and orchestral selections. The platinum-selling solo album received rave reviews from critics and was a smash-hit in Haiti. In 2000, he released his second solo effort, The Ecleftic: 2 Sides II a Book, which featured musical guests such as Kenny Rogers and Mary J. Blige. In 2002, Jean released his next solo effort, Masquerade. This was followed by his Greatest Hits album and The Preacher's Son, both released in 2003. After a series of singles and musical collaborations, Jean announced that he would release an eponymous studio album in 2010. Jean is married to designer Marie Claudinette. They have one daughter, Angelina Claudinelle Jean, who they adopted in 2005. The family resides in New York City.